This brand new, never opened, Cowboy with horses design 2016 felt calendar kit is easy and fun to do. It is made in the USA and has a wonderful finished size of about 16 inches by 24 inches. 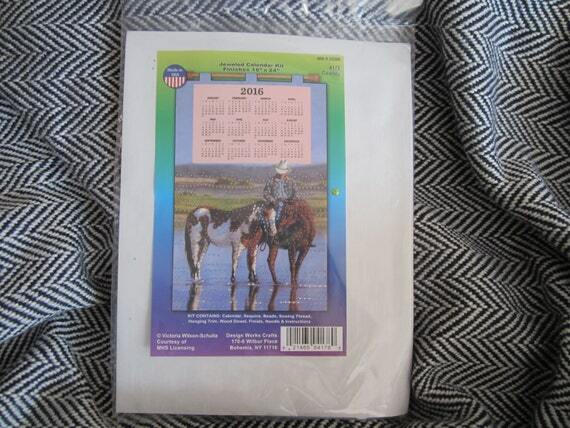 In this kit you get a lovely per-printed felt calendar that includes a full 2016 calendar on the front of it with a beautiful picture of a cowboy with his horses above it. With the included supplies you can sew on the sequins and beads to the calendar. [or you can glue if you prefer, but glue is not included in the kit] Then when you are done decorating it you can hang up your work of art with the included wooden dowel rod and matching end caps for a finished look. Listed below are all the supplies that are included in this wonderful kit. Felt Calendar, Sequins, Beads, Sewing Thread, Hanging Trim, Wooden Dowel, Finials, Needle, and Instructions! This would make a great gift for anyone who loves craft projects or for yourself to enjoy. For more info and pictures click here to see my Etsy shop listing.